Geotechnical Engineer - Vernon Hoffman, P.E. A four story office building was planned adjacent to an existing four-story building. The site was underlain by dolomitic bedrock with a variable depth of overburden, typically less than 25 feet deep. The geotechnical exploration revealed the presence of solution activity and cavities or domes with the soil overburden. Solution activity was most notably present in the end of the proposed building adjacent to the existing building. Soil dome collapses were observed around the adjacent building in the form of small surface drop-outs or sinkholes. Dynamic compaction was selected as the subsurface improvement technique to collapse existing soil domes and to improve the subsurface profile sufficiently to provide shallow foundation bearing support. Crushed stone was used as crater backfill. 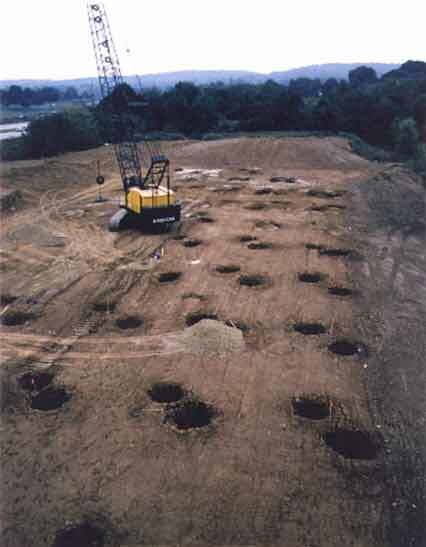 The sequence of operations included performing weight dropping at the four corners of the planned footings. Weight dropping was performed in two stages, with the opposite corners of the footings being performed per stage. At each compaction point, the crater was backfilled when the crater depth reached about 5 ft., before additional drops were made. Drops were terminated when the penetration per blow decreased below 6 inches. Cumulative crater depths of up to 14 feet were observed in areas of soil domes.